Little Tikes Wagon Pink is one of our best baby girl gift baskets. We offer Free Toronto hand delivery. The new baby wagon will be a great toy for future or for older siblings, also for baby shower gift basket.One of our best sellers of baby girl gift hampers baby girl gift baskets filled with newborn products to welcome new baby girl to the world. Baby girl wagon basket Little Tikes is one of our best sellers. Baby girl gift baskets. The red baby wagon will be great to store future baby toys. Also, great baby shower gift. Baby girl wagon basket. 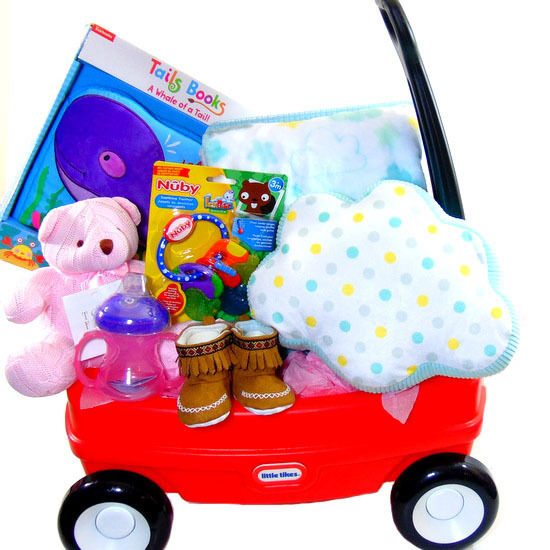 Send the red wagon gift to newborn with an older sibling. 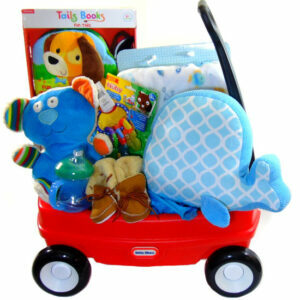 Products inside the wagon are for newborn and the wagon for an older sibling to play with. Congratulation. It’s A Girl. Welcome Baby Girl All messages delivered with baby gift hamper.